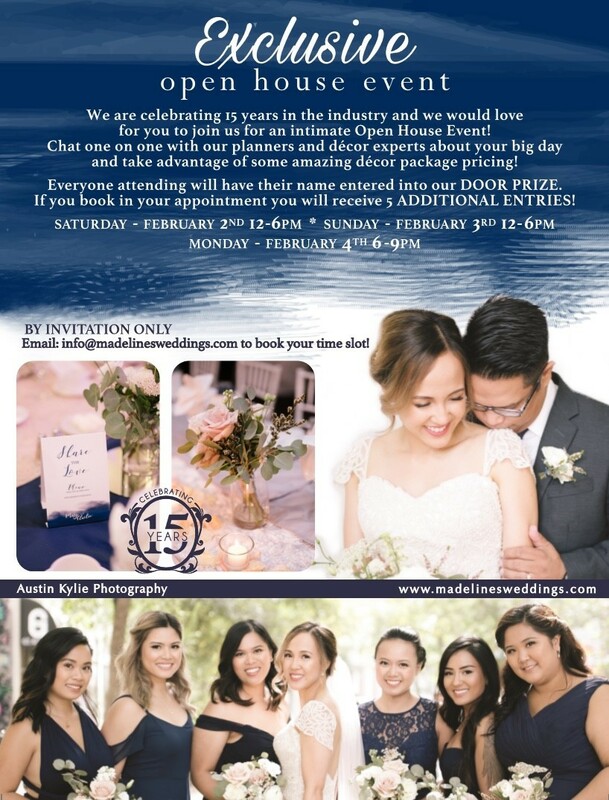 Madeline’s Weddings & Events is hosting an Open House! This Open House will be an intimate and interactive event where you will be able to chat one on one with our wedding planners and decor experts about your big day! We will have some fabulous displays and designs set up and you can enjoy some sweet treats while you check out our line of luxury linens! We’ll be featuring some amazing decor packages available to those attending! When booking one of our packages you will be able to spin our Wedding Wheel to win something FREE for your wedding AND everyone coming in will have a chance to win our door prize!! Contact us now at info@madelinesweddings.com to book your appointment.